Oceania Cruises and Azamara Club Cruises are both under-the-radar cruise lines with a passionate following but not a ton of mass-market awareness. Both are upscale lines with small ships, and cater to the older traveler who's more interested in destination immersion on a comfortable, uncrowded ship than nonstop activity and varied evening entertainment. Not only do the two lines have a similar take on cruising but they actually use sister ships, which are former Renaissance Cruises vessels (known to fans as "R-class ships"). How exactly does an interested cruiser go about choosing between the two cruise lines? 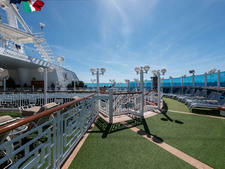 Let us pit Azamara vs. Oceania to demonstrate the differences between the lines. Oceania cruises has a fleet of six: four 684-passenger, R-class ships (Insignia, Nautica, Regatta and Sirena), which are all former Renaissance Cruises vessels, and two 1,250-passenger, O-class ships (Marina and Riviera), which were custom-built for the line in 2011 and 2012, respectively. 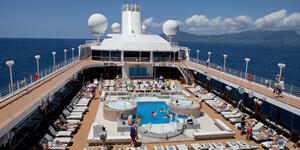 The Azamara Club Cruises fleet is half the size of Oceania's. It consists of the 690-passenger Azamara Journey and Azamara Quest, and 702-passenger Azamara Pursuit, which joined the fleet in 2018. All three ships are also former Renaissance Cruises vessels, and they are nearly identical to Oceania's R-class ships in terms of layout. Both lines have, of course, refurbished and redesigned the ships to their own style. Azamara Journey and Quest underwent dramatic makeovers in 2016, and Pursuit was extensively updated when it joined the fleet in 2018. Oceania's Riviera was refurbished in 2015, and Marina was done in 2016. In 2018, Oceania embarked on its OceaniaNEXT initiative, which is pumping $100 million into the refurbishment of its R-class ships: Insignia (launching December 2018), Sirena (launching May 2019), Regatta (launching September 2019) and Nautica (launching June 2020). The updates will include redesigned staterooms and suites, updated restaurant decor, and refreshed bars and lounges. Both lines fall squarely in the upper-premium/luxury-lite category of cruises. That means ships are not suite-only (offering both inside and ocean-view accommodations, as well as balconies and suites), and are on the larger end of the ship size spectrum for upscale vessels. Fares are more inclusive than the mainstream lines, but not nearly as inclusive as lines like Regent Seven Seas or Seabourn. Choose Azamara if you want more inclusive fares. 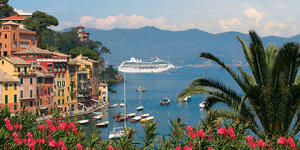 Azamara Club Cruises is not all-inclusive, but it does offer significant fare inclusions. Fares in all categories cover all nonalcoholic beverages (bottled water, soda, juice and specialty coffee and tea) and select alcoholic drinks (including select wine, beer, spirits and cocktails). In addition, fares include all gratuities, self-service laundry, concierge service, shuttles to port towns (in select destinations) and an AzAmazing Evening shoreside event on nearly every sailing. In contrast, Oceania's fares include specialty dining and unlimited Wi-Fi for one login per cabin (which Azamara's do not) and nonalcoholic beverages, but you will have to pay for alcoholic drinks, tips, laundry and all shore excursions. Choose Oceania if you want cheaper fares for entry-level cabins. Azamara's fares include more -- but they're also typically more expensive. Oceania is your line if you want to pay a lower base fare and then add on for only the extras that are important to you. For example, when comparing September 2019 Mediterranean cruises on both lines' smaller ships, daily per person rates for an inside cabin ran about $430 per night on Azamara and approximately $280 per night on Oceania. In addition, Oceania has been running the OLife Choice extra perks promotion, which adds your choice of free amenities to the fare. With the current version of the offer, passengers receive economy-class airfare plus a choice of complimentary shore excursions (number dependent on itinerary length), House Select beverage package or onboard credit (amount varies by cruise length and cabin category). All Oceania fares included unlimited Wi-Fi for one login per cabin. While OLife fares can be a great option for getting more from your dollar, note that Oceania lists two prices for every cabin: cruise only (the fares we compared with Azamara above and which are not eligible for OLife perks) and promotional fares (which are eligible, but are also significantly higher). Both cruise lines focus on destination and explorations ashore, with plenty of overnights in port and a minimum of days at sea. 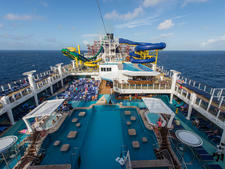 They cruise the world, kkkwith options to book back-to-back cruises without repeating many or any ports of call. Choose Azamara if you want to cruise to just one country at a time. The whole "if it's Tuesday, it must be Belgium" concept of cruising works for travelers looking for a regional overview, but it feels rushed to those who want to truly explore one place. 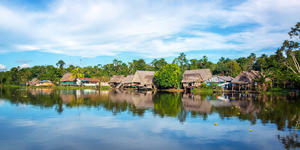 To serve the latter type of cruiser, Azamara offers "country intensive" voyages. 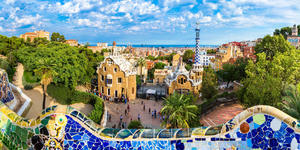 Itineraries with a heavy focus on one country, on offer during 2019 and 2020, include Spain, France, Italy, Croatia, Japan, Greece and Norway. Additionally, there are cruises that combine visits to Australia and New Zealand. Choose Oceania to visit exotic destinations. With six ships, compared to Azamara's three, Oceania can cover the globe more effectively than its competitor. While Azamara hits cruise favorites like the Caribbean, Europe, Asia, Australia and Central America, Oceania visits those places as well as destinations such as Africa, Alaska, South America and the Amazon, and Tahiti and the South Pacific. In addition, Oceania offers an annual 180-day, around-the-world cruise that circumnavigates the globe, allowing passengers to book the entire half-year journey or just select segments. 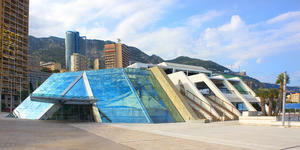 Both cruise lines offer a full range of for-fee shore excursions. You'll find half- and full-day options, including gentle walking tours, exploration via motor coach, bike trips, market visits, catamaran cruises and more. Choose Azamara if you want one free shore excursion. On nearly every cruise, Azamara offers the complimentary AzAmazing Evening, which invites all passengers to a private event that highlights the culture of the cruise region. 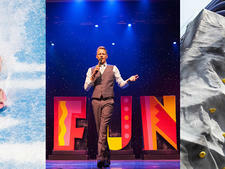 You might see an acrobatic show by Les Farfadais at the waterfront Grimaldi Forum in Monaco, sip cocktails prior to a performance of the St. Petersburg Symphony Orchestra in Russia, or watch traditional dances in an outdoor canyon setting in Mexico. Or for immersive tours that focus on the local experience. Azamara tries hard to be creative with its shore excursions in order to immerse its passengers in various aspects of the ports of call. Its "Nights Local" tours take advantage of evenings in port to take passengers to the theater, dinner or a signature spot for cocktails, or on a starlit city tour. "Meet Local" excursions focus on interactions between passengers and local residents, with visits to private homes, while "Taste Local" tours allow participants to sample local delicacies, tour food markets and try their hand at cooking regional dishes. Choose Oceania if you want to purchase a package of shore excursions at a discount. 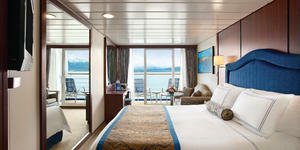 Oceania offers two packages for cruisers who want a simple way to book all their excursions for less money. The top-of-the-line Your World Collection allows you to pick a select number of excursions from everything on offer by the cruise line, including its upgraded Oceania Select and Oceania Exclusive excursions. The package nets a savings of 25 percent off a la carte prices. Alternatively, the Unlimited Passport Collection lets you pick from an array of Oceania's excursions -- though not all of them -- and you can save up to 40 percent versus paying per shore tour. 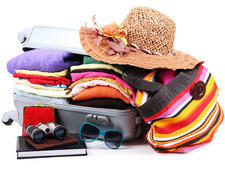 With this package, you're also extended a discount on any of the Select and Exclusive choices booked separately. Oceania and Azamara are egalitarian lines, with cabins ranging from squishy inside staterooms to over-the-top spacious suites. On the two lines' former Renaissance vessels, standard cabins do run small for upscale lines and standard bathrooms are particularly tight. Choose Oceania if you want more spacious standard cabins. If you don't want an older-style, somewhat small standard inside, outside or balcony cabin, you'll want to choose Oceania's O-class ships, Marina and Riviera. The outside and balcony rooms are generously sized, and bathrooms are much more spacious, with separate bathtubs and shower stalls, than the ones you'll find on its (and Azamara's) smaller ships. Or if you want incredible beds. Oceania has always focused on an amazing night's sleep. Its Prestige Tranquility mattresses, decked out with 1,000-thread-count, 100 percent Egyptian cotton linens, are so comfortable that you will find it difficult to get out of them -- whether it's at 7:30 a.m. after a great night's sleep or at 3:30 p.m. after you sat down for "just a minute." Suites come with extensive pillow menus as well. Choose Azamara if you want the spa experience in your choice of accommodations. While both lines have an array of suites -- some with butler service -- and staterooms (interior, ocean view and balcony), Azamara also offers Club Spa Suites. Added to the fleet in 2016 and located near the Sanctum Spa, these accommodations feature 414 square feet of interior space and a 60-square-foot balcony. Some sweet amenities make this category appealing to anyone that loves a spa-centric experience. Look for a glass-enclosed bathtub -- with an ocean view -- and separate rain shower in the bathroom. Passengers receive daily delivery of healthy snacks and in-room, spa-style (think relaxing) music. Azamara and Oceania ships feature a main restaurant serving global cuisine, a buffet venue with indoor and outdoor seating, and several specialty restaurants (including a steakhouse and Italian venue for both lines). Choose Oceania if you want more specialty restaurants with no extra charge. Oceania's dining team do their best to get every passenger into each specialty venue once, if not multiple times. (Repeat visits depend on cabin category, length of cruise and your willingness to eat at 9:30 p.m.) Most of its R-class ships feature the Italian Toscana and steakhouse Polo Grill, and the O-class ships add two additional restaurants: the French Jacques and pan-Asian Red Ginger. 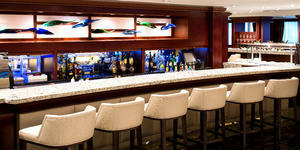 Sirena offers the popular Red Ginger as well as Tuscan Steak (a hybrid restaurant inspired by Toscana and Polo Grill). 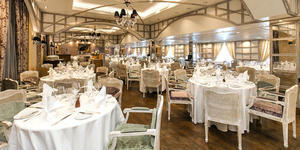 It also offers Jacques Bistro, a French lunch served in the main dining room. We would be remiss if we didn't mention Oceania's amazing afternoon tea, served from 4 to 5 p.m. every day and complete with white-glove service, pots of Twinings teas, finger sandwiches, cakes and pastries, and scones with clotted cream and jam. Or if you want onboard and onshore opportunities to learn about food. Oceania has a passion for food, and that extends beyond the onboard dining venues. Its Culinary Discovery Tours are custom-designed for the line by its executive chef Kathryn Kelly and may include local dining experiences, cooking classes and tours of farms and food markets. In addition, Marina and Riviera feature an onboard cooking school with 12 prep stations and a main teaching station, complete with video so everyone can see what's cooking. The intimate classes will teach you techniques you can bring home and ply you with delicious food and wine. Choose Azamara to experience one of the best deck buffets and parties at sea. 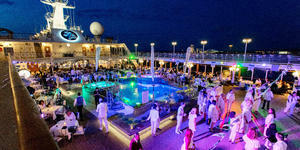 Azamara hosts its poolside White Night Party once per voyage and it's not to be missed. While you may initially think this is another ho-hum activity thrown by the entertainment department, it's actually a standout event for the cruise line. Passengers are asked to wear white and a surprising number of passengers do. The crew stages an elaborate deck barbecue with an outdoor buffet that features everything from grilled meat to fresh seafood to a luscious dessert table groaning with just about everything you can imagine. Once passengers have enjoyed their meal, the event morphs into a dance party with live music that keeps everyone on deck late into the evening. 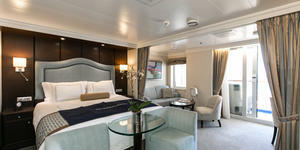 Choose Azamara if you don't spend much time onboard when the ship is in port. Azamara prides itself on being destination focused. As a result, its ships don't schedule a ton of daytime activities when in port; the expectation is that nearly everyone will be out and about. 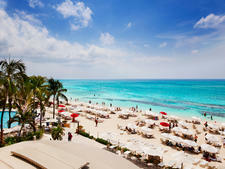 On sea days, though, you can watch movies, play Ping-Pong, hit the pool or spa, participate in trivia sessions and more. Or if you plan to go to every evening show. While neither Azamara or Oceania are particularly strong in the evening entertainment department, Azamara has a slight edge. That's because they only hire cruise directors who are also entertainers that can star in their own shows. This gives a bit more choice in the programming throughout the voyage, and some of the cruise directors are quite talented performers. Choose Oceania if you like to gamble onboard. Azamara ships do not have a casino, so if you like to play slots or hit the tables, you'll need to book with Oceania instead. The casinos aren't huge but they do offer table games such as craps, roulette, poker and blackjack as well as slots. 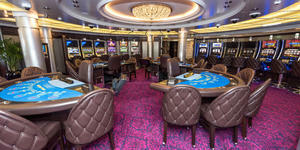 Oceania's gaming venues are part of the Casinos At Sea Rewards Program. 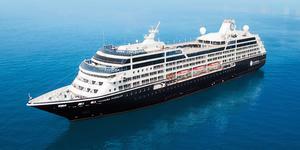 Neither Oceania nor Azamara is a good choice for families traveling with children. Neither have kids clubs onboard and, for the most part, they don't offer any child-specific programming. 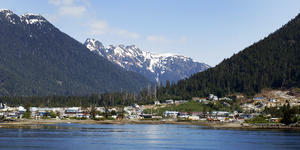 Choose Oceania if you're traveling to Alaska and want to bring kids. While Oceania doesn't cater to children on an ongoing basis (there are no kids clubs onboard and children must be at least 1 year old to sail), it actually has a very strong program for children when in Alaska. From May through September, kids ages 5 through 12 can participate in Oceania's Alaska Explorer Youth Program. Supervised by youth counselors, all games, activities and events have a connection to Alaska's culture, flora or fauna. Choose Azamara if you're trying to avoid children on a cruise ship no matter where you sail. Azamara doesn't market itself as a family-friendly cruise line so unless it's summer vacation or a holiday cruise, you probably won't see many little ones. However, children that are at least 6 months old (12 months on transatlantic itineraries) are eligible to sail. There is no kids club or programming to keep them busy, though, so if you plan to bring your children onboard, you'll be responsible for keeping them entertained. Choose Oceania if you want a variety of fee-included, specialty dining; want to experience a slightly larger ship with more modern amenities and onboard activities; and want the choice that comes with a larger fleet with different classes of ships, able to cover more of the world each year. Choose Azamara if you want more inclusive fares without having to look for special promotions; an emphasis on destination experiences by day and night with a local flavor (including one free shoreside event); and a fleet that makes choosing cabins and itineraries easy because its three intimate ships are nearly identical. Plus, Azamara ships have exceptionally capable and friendly crews that go out of their way to make passengers feel at home from the moment they step onboard.